Some interesting - and large! - sunspots on the Sun today. I like to include a scale image of Earth when posting sunspot photos; it helps give a sense of how large some of these cooler magnetic disturbances are on the Sun's surface. 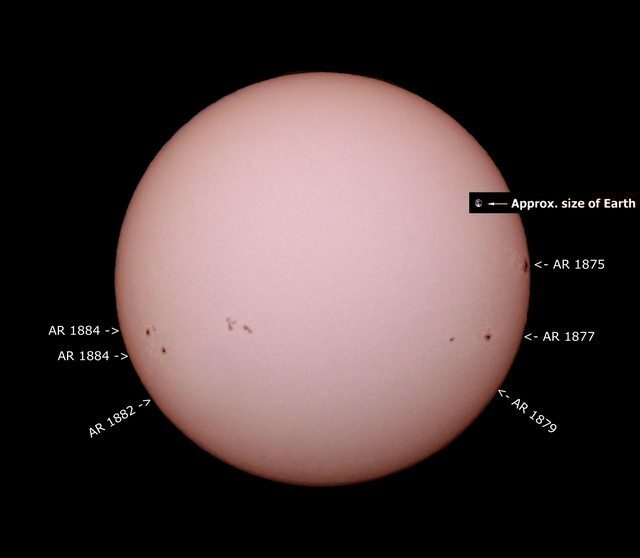 Labelling the sunspots groups is helpful as well - I like to have some idea what I'm looking at in terms of it's scientific designation, even if the sunspots will disappear. Taken through a 6" f/5 reflector at prime focus with Canon T3, 400 ISO @1/4000 sec. Post: Slight contrast boost, image dimmed, orange color added slightly to bring out contrast of faculae. As we age, many of the hardships or poor experiences fade in one's memory, and we often see the past through rose-colored glasses. This can have the effect of making us long for what we fondly remember as simpler, easier times, when life was always better. Of course, this usually isn't true. But some things really do retain their luster and value over time. An example of that is the telescopes made many decades ago. At the time, they were often prohibitively expensive for amateur astronomers, and one instrument's purchase meant saving up for many months or even years. 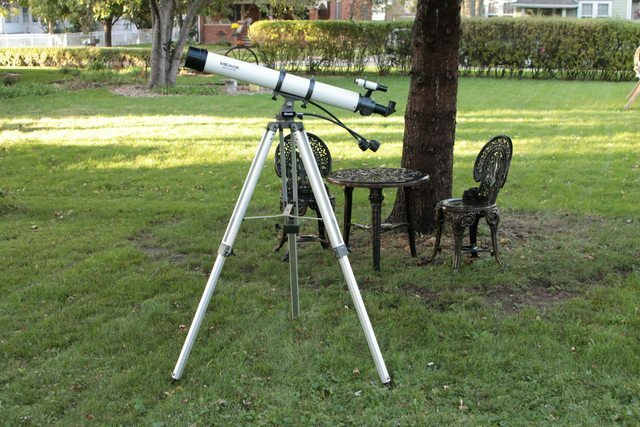 These days, these scopes can be found in the garages and basements of many a home, neglected, dusty, or dragged out only for the occasional, spectacular astronomical event such as a bright comet. This is too bad, because many of these instruments are superior in many ways to presently available telescopes. An example, you ask? But of course! How about this? Here's what's happening in the night sky for the week of October 28 thru November 3 Want to see what's up in the sky this week? This daily reminder chart will let you know lots of individual, time-sensitive events occurring. Also, don't miss this week's Eyes on the Sky video about some fascinating stars in Cepheus that you can see either naked eye, with binoculars, or with a small telescope. It's time to stop telling first-time stargazers "Buy binoculars"
"Hey... you're into astronomy, right? What telescope should I get my spouse / child / relative?" Here's what's happening in the night sky for the week of October 21 thru October 28 Want to see what's up in the sky this week? This daily reminder chart will let you know lots of individual, time-sensitive events occurring. Also, don't miss this week's Eyes on the Sky video on some of the time-sensitive events occurring throughout the week. Here's what's happening in the night sky for the week of October 14 thru October 20 Want to see what's up in the sky this week? This daily reminder chart will let you know lots of individual, time-sensitive events occurring. Also, don't miss this week's Eyes on the Sky video on some of the time-sensitive events occurring throughout the week. Here's what's happening in the night sky for the week of September 30 thru October 6 Want to see what's up in the sky this week? This daily reminder chart will let you know lots of individual, time-sensitive events occurring. Also, don't miss this week's Eyes on the Sky video on some of the open clusters to view in Perseus.